Vol. 1 No. 5 JANUARY 19, 1953 PRICE 2 As. The bestial action of the police of Karachi in the three tragic days, was marked with indiscriminate shooting of teen-agers and old people. They seemed to have a special liking for the blood of those, who as human beings could not resist helping their injured brethren. According to hospital authorities about a score of persons have been permanently disabled and many of the patients shall take at least one month to be discharged from hospitals. 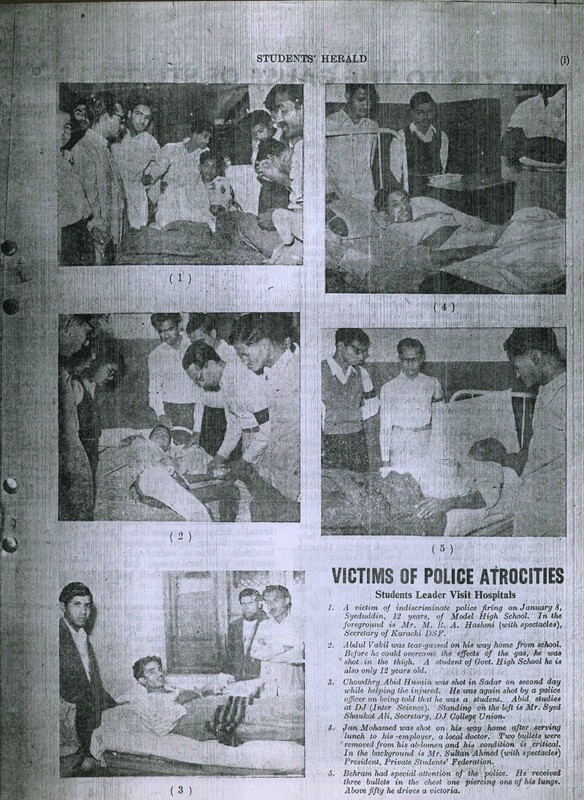 The tale of the extremely tragic death of a young Hindu student Mansukhlal, who had just finished his camping in the much-trumpeted Scout Jamboree, shall long be remembered by the citizens of Karachi. Donning his gray scout uniform this Sindhi youth, full of vigour and enthusiasm, was helping the injured in front of Paradise Cinema. The police could not tolerate this “criminal” action of the young boy and soon sent the young soul to its heavenly home. Before taking this last breath, he might have pondered, what for was all this learning and listening about the duties of a scout. There is a great number of such tales about police brutalities and if one had time and space volumes could be written about them. 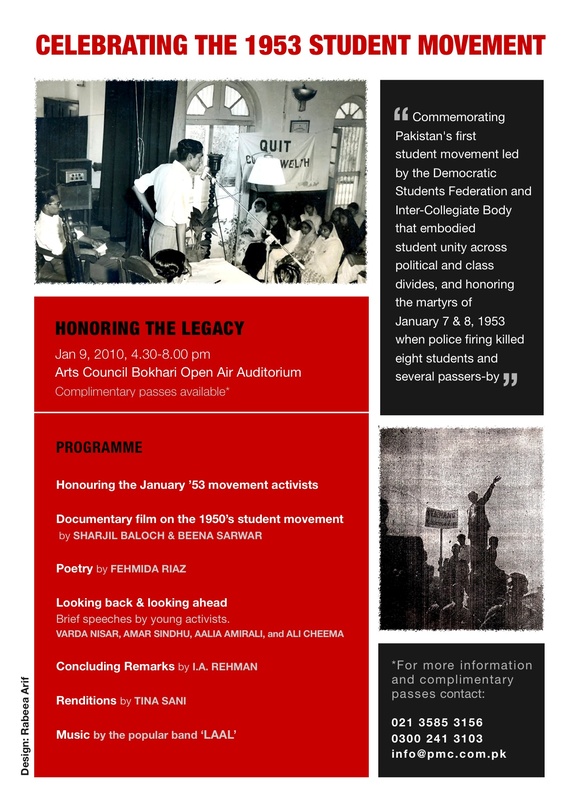 VENUE, DATE AND TIME: Jan 9, 2010, at 4.30 pm at the Arts Council Bokhari Open Air Auditorium, Karachi. Brief comments by young activists Alia Amirali (QAU), Varda Nisar (Karachi University), Amar Sindhu (Jamshoro University) and Ali Cheema (LUMS). All, especially students and young people are invited to attend. 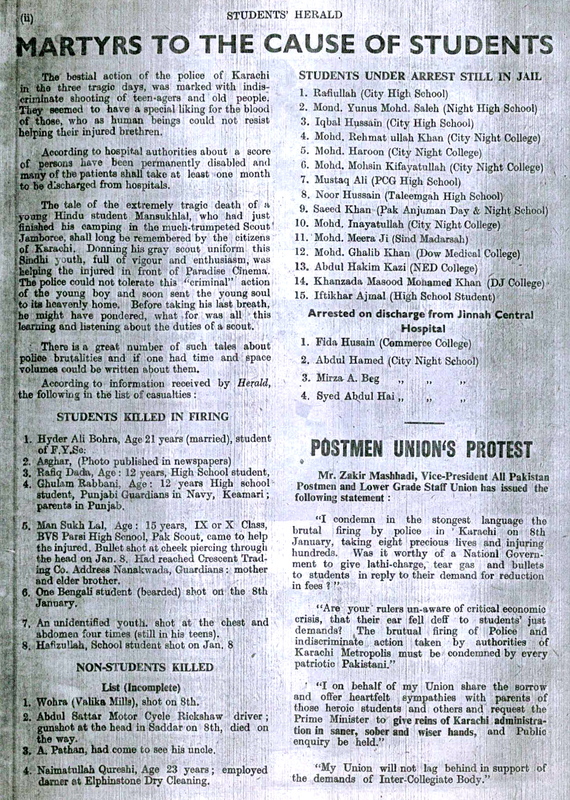 The event re-visits January 8, 1953, traditionally commemorated as ‘Martyrs’ Day’, in memory of students and passers-by in Karachi killed by police firing on the peaceful Jan 7, 1953 ‘Demands Day’ procession organized by the Democratic Students Federation (DSF) and the Inter-Collegiate Body (ICB) that linked the student unions. The High School Students Federation (HSSF) also actively participated in this movement. The students’ demands included revising the fee structure (make fees payable monthly instead of six-monthly), laboratory, library and hostel facilities, the building of a proper University in Karachi (where none existed) and security of employment. The High School Students Federation also actively participated. 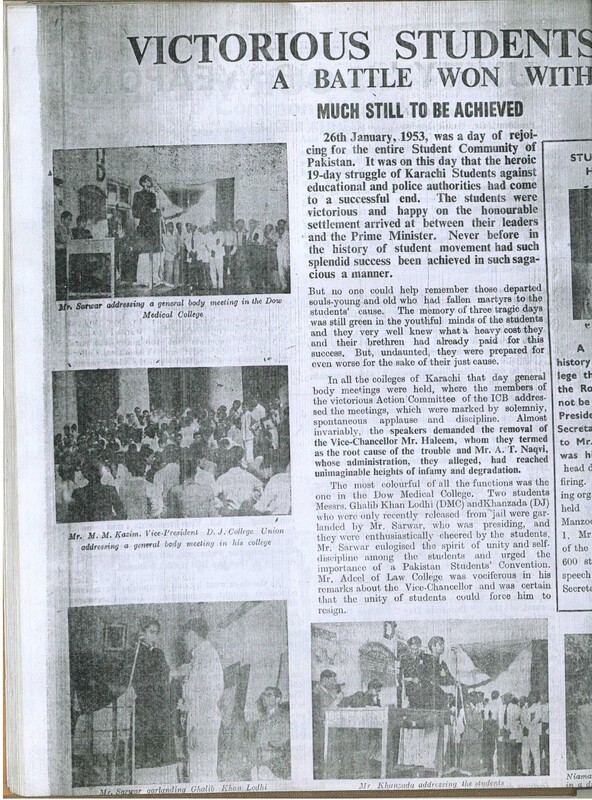 These events catalysed Pakistan’s first nation-wide, broad-based student movement. 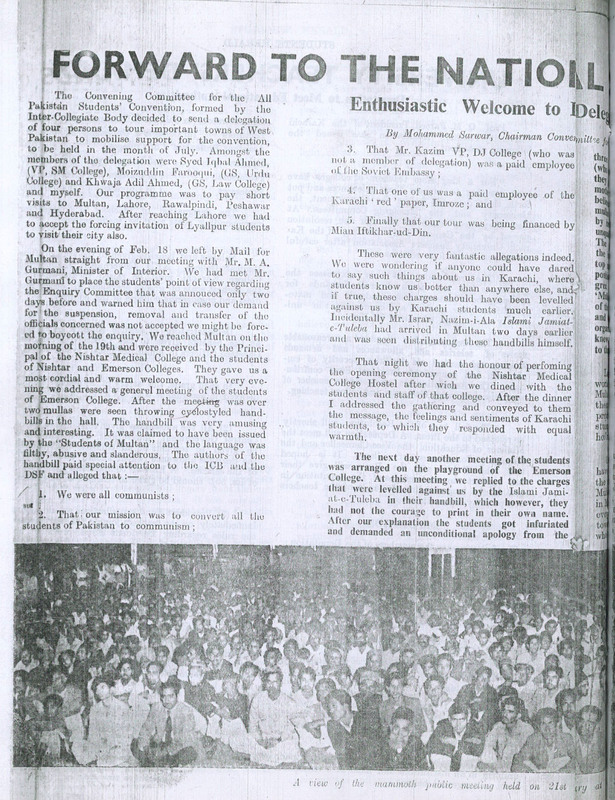 DSF stood for student unity across all divides and formed an All Pakistan Students’ Organisation (APSO) in December 1953. SOLIDARITY CONTRIBUTIONS: We will be happy to accept whatever friends and well-wishers want to contribute to the event. We will acknowledge individuals and organisations in the brochure (unless they ask not to be mentioned). 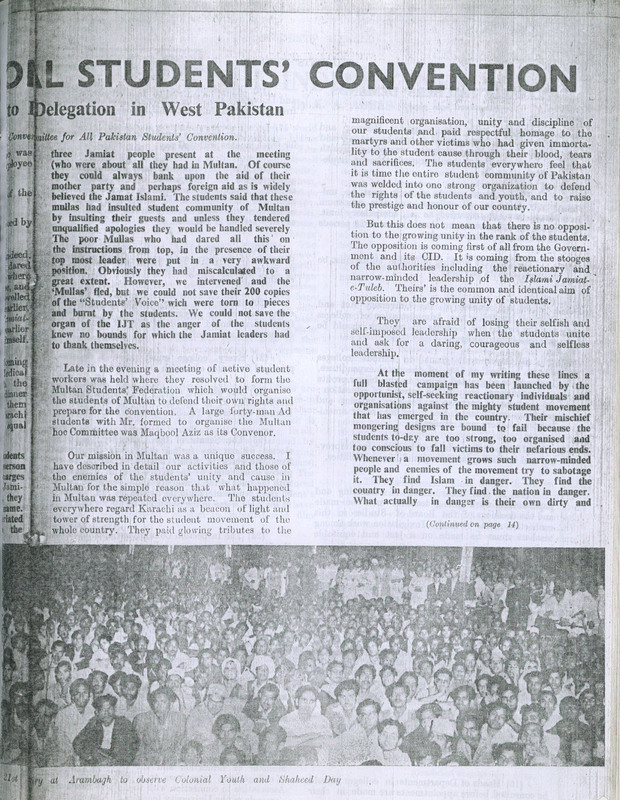 Read below, text from the Students’ Herald, March 9, 1953, Convention Chairman Mohammad Sarwar’s account of the trip, including the efforts by the Jamat to disrupt their meetings and to discredit them.